In most areas of the world, tailors commonly outsource their trouser making: cutting in-house but then sending the work to ateliers used by several different houses. 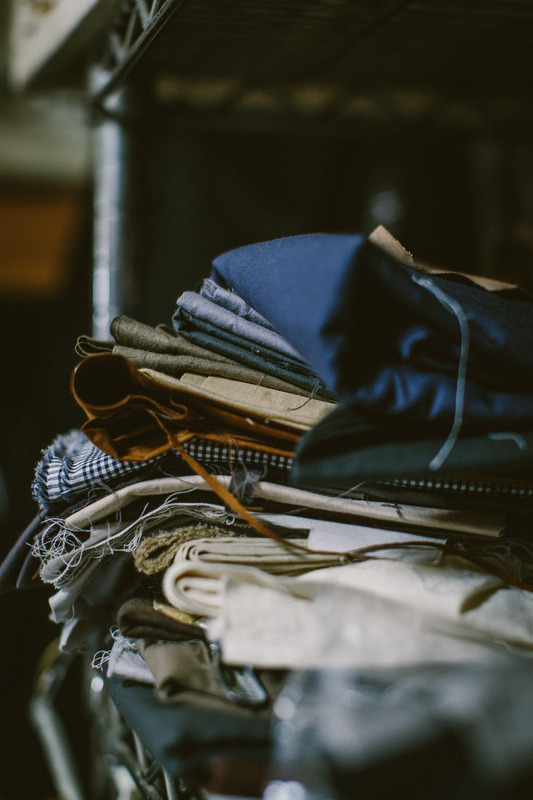 Just as common in recent years has been the move for those ateliers to push their own brands. The trend has varied in breadth and intensity in different cities, but there are examples everywhere: Cerrato in Naples, The Disguisery in London, and both Osaku and Igarashi in Japan. Although Osaku and Igarashi vary in their backgrounds, their location and their experience, the work is at a similarly high level. The most notable difference is location. Toru Igarashi (above) set up down a little side street in the centre of Tokyo in March this year. He now has three people working for him in the shop, and travels to Singapore for trunk shows. Hayato Osaku (below) is an hour’s drive outside Tokyo, in the town he grew up in. When we visited it was nice to get out of the city and see a little countryside. Cabbages were being farmed on the allotment above the house. Osaku set up there five years ago, and is better known than Igarashi. But the latter has been able to get greater attention recently because of his location. Customers, and particularly foreign visitors, can pop in more easily. Osaku visits customers in town - people don’t come to see him. But still, he has considered opening a studio closer to Tokyo to make things more convenient. “I couldn’t afford to live there really, but this might make things easier for customers. Luckily I also don’t need any more at the moment,” he says. 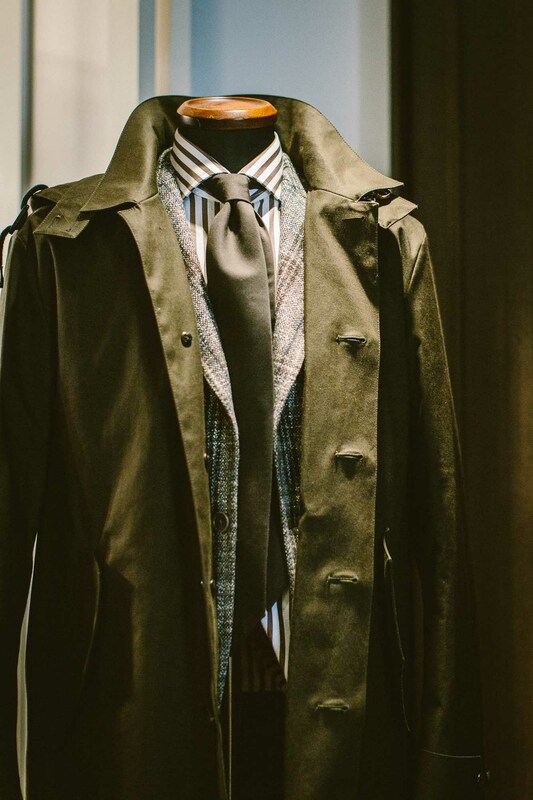 Both makers began life in larger scale tailoring production (as is common with tailors too). 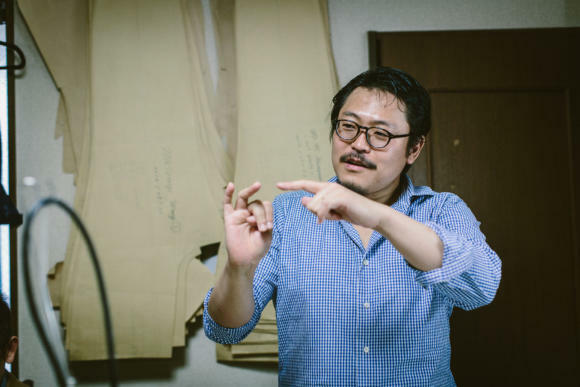 Igarashi worked in a suit factory for two years before apprenticing under a Japanese trouser maker, for another two years. 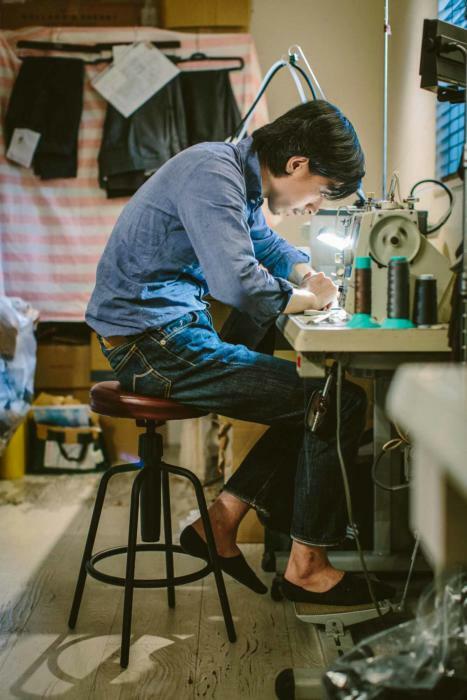 He then joined Strasburgo, the Japanese retail chain that supports a lot of bespoke makers, cutting and making under their brand. And back in March this year, he set up his own shop. 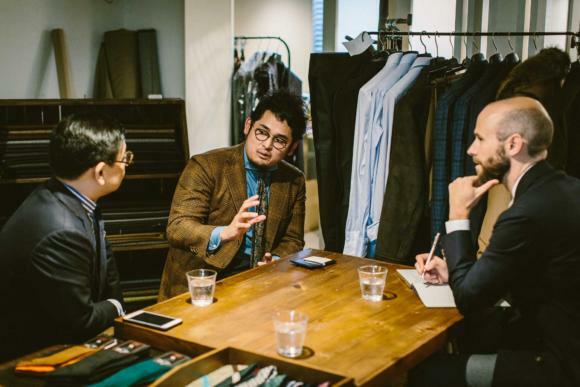 “There are a lot of up-and-coming tailors in Japan, mostly trained in Italy,” Igarashi says, “but I often feel they overlook the importance of trousers. “The Japanese body is very different from the European - with a flat bottom, higher crotch and slim leg. It’s important to have a pattern that is specific to their body shape." 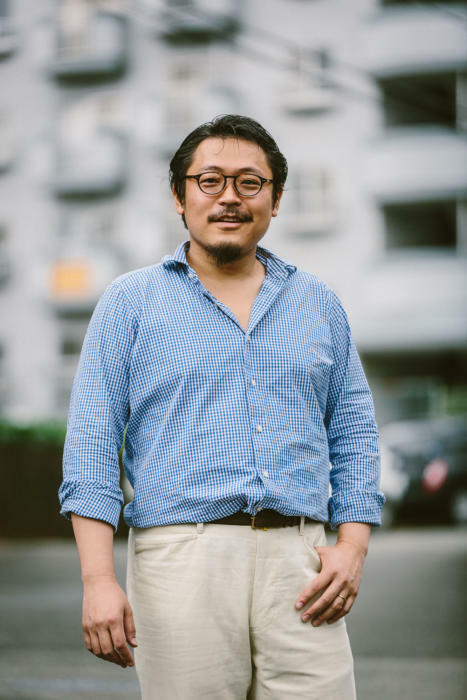 Igarashi developed two different models when he was apprenticing, Japanese and Western, based on observations that foreign brands like Incotex often didn’t fit locals very well. These are still the basis of much of his work, though of course each pair is cut individually from a unique paper pattern. 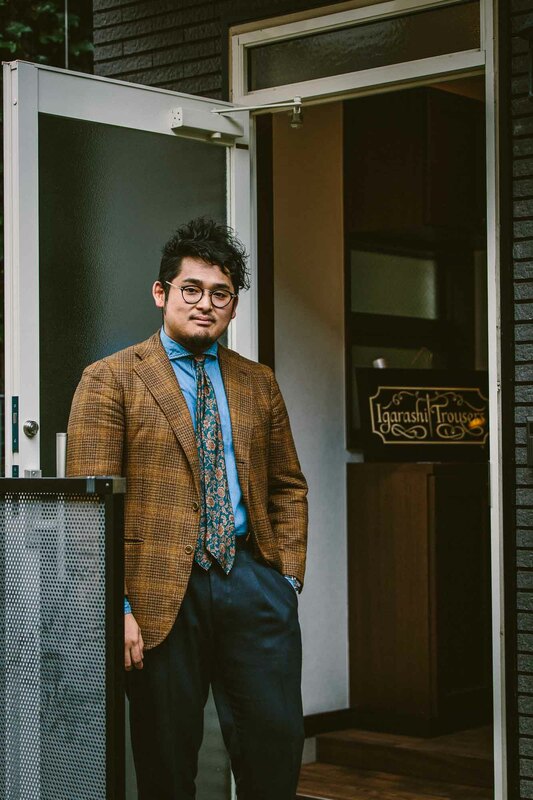 Osaku briefly worked at Ichibankan, the large tailoring workshop where Takuya Kondo (Vick Tailor) also trained. He left after a year, which was unfortunate in terms of expertise, but great timing for work as several other Ichibankan employees were leaving at the time, and needed trouser makers. Osaku then worked for Salone Ondata - where he broadened his tailoring knowledge - but was still a little rudderless until he met Noriyuki Ueki of Sartoria Ciccio. Osaku went from strength to strength after that, working for Ciccio for a while before setting up his own brand - and designing a range of trousers for department store Isetan (brand M039). 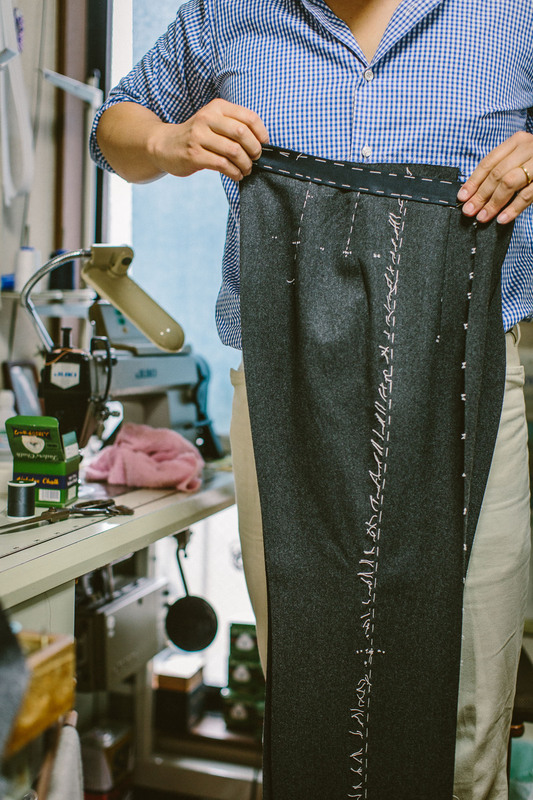 Both tailors include a lot of handwork, tack stitching and the like (that's a pair of Igarashi's trousers at the top of this post). Their prices are also pretty reasonable: ¥100,000 for Osaku and ¥75,000 for Igarashi. But given I have no immediate plans to travel to Japan again, I didn’t commission anything and the fit will be something for another day. Photography: Jamie Ferguson @jkf_man. Thanks go to Masaichi Hasegawa of Gaziano and Girling and Jason Yen of Gaziano and Girling/Camps de Luca for their help with organisation and translation. You can follow the discussion on Japanese trouser makers: Osaku and Igarashi by entering your email address in the box below. You will then receive an email every time a new comment is added. These will also contain a link to a page where you can stop the alerts, and remove all of your related data from the site. I’m always more interested to read about artisans who specialize and make one thing. There is something solitary about it that attracts me. How can these prices be considered “reasonable” There are “anonymous” small “old school” tailors throughout the world that can make garments of equal quality for a fraction of the cost. They do make good trousers and please don’t forget the cost of living in Tokyo is really high , even higher than London and NY. Any experience with the Disguisery? I they make bespoke in London to Savile Row standards they seem pretty good value? The last image is very interesting. The ensemble is perfect. As i am interested in sourcing a raincoat could you provide the details for this one please? Actually if you could do a write up on raincoats it would prove very interesting as i cannot find one to purchase (my ideal option) that suits me therefore, i may have to consider bespoke. its very interesting. The picture are perfect. Very interesting! 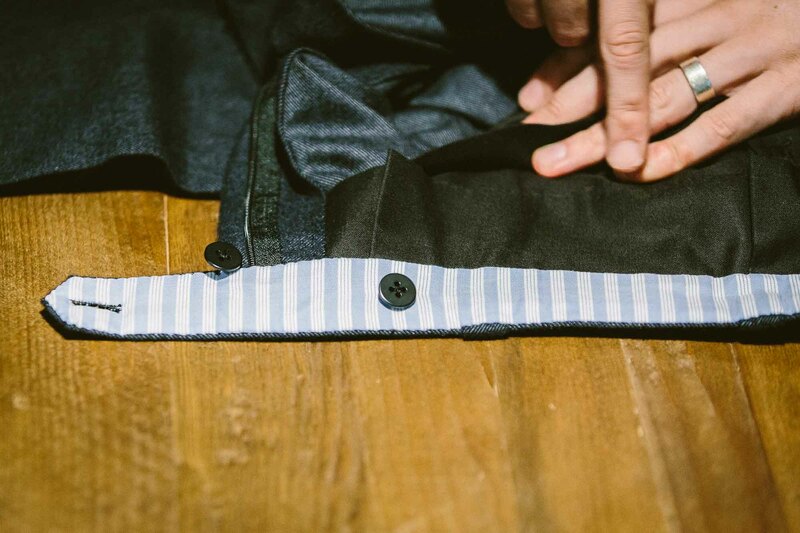 Can you explain the curved waistband and its benefits? …“The Japanese body is very different from the European – with a flat bottom, higher crotch and slim leg. It’s important to have a pattern that is specific to their body shape.”…. I remember many years ago buying a some Korean-made underwear that was being promoted as a sort of Asian Hanro, or similar, but obviously at an attractive price. The fabric, and apparent stitching/workmanship was great, but the fit was the worst I can think of, very much reflecting the above quote. 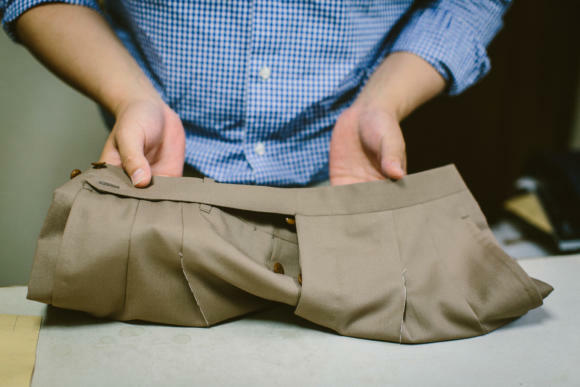 “Short” where they should have been “long”, “wide” where they should have been “narrow”, etc…..
Would you have the address of Igarashi trousers handy? I can’t seem to find it online. Do you know where I can find Igarashi’s tie in the second picture? No, sorry Jack. I suggest you get in contact with him.